I'm back today with a great collection for Fall from indie brand Illyrian Polish inspired by Stranger Things. So...have you seen Stranger Things?? It's a Netflix produced show, a sleeper hit and I'm totally in love with it. It's a must see if you like creepy thriller dramas. It's set in the early 80's and has some excellent child actors, and it's easy to binge watch. I've already seen season 1 twice and am eagerly anticipating season 2. This collection has five polishes that totally embody the show's aesthetic. I purchased two of them, and then was asked to review the full collection which I am excited to be able to show you today. 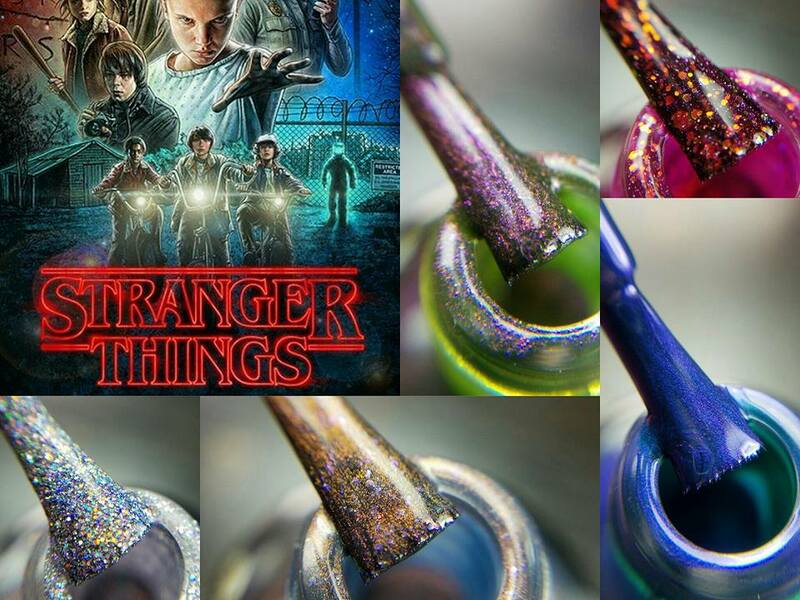 Eleven is a purple-y berry jelly with red to green color-shifting iridescent glitter and a scattering of holographic pigment. This is a little thick but not difficult to apply. I used three coats here but you could get away with two for a more translucent look, or layer it over an opaque base color. This didn't dry as gritty as I was anticipating, I only needed one layer of a thick top coat for a smooth finish. See those shifty glitters on the side of the bottle?? Yeah, so dope. Mouth Breather is a dark teal blue with violet shimmer. This seemed a bit thick to me at first too, but it applied fine, no problems. This dries down dull, so you'll want a glossy top coat for shine. I'm The Monster has a murky green base with purple/pink micro shimmer flecks. Another formula I found to be a little thick and dries kinda flat, similar to Mouth Breather, but this was not as opaque, presumably to allow the shimmer to take center stage. I used three coats here. Swampy perfection! The Upside Down is a glitter bomb with a greyed purple tinted sheer base with lavender & silver holographic glitter and copper-to-green shifting iridescent glitter. This is amazing, it applied almost like a regular polish and covered completely in two coats. Not what I was expecting by such a dazzling, dense glitter polish! And again, this doesn't dry super textured so I only needed one layer of a thick top coat. Impressive! Demogorgon is a blackened indigo blue with orange/yellow shimmer and small iridescent purple flakes. This too was viscous, which I'm starting to think is the norm for this brand, but I'm not complaining because they applied really nicely for me. This is two coats. This collection will be restocked on the Illyrian Polish website on Friday November 11th at 6pm CST (along with some other shades that I will be showing you soon). I purchased Eleven and Demogorgon for $10.75 each and the other shades were sent to me for review. You can see more photos on their Facebook page and Instagram. Let me know what you think of these shades! Are you a Stranger Things fan?? Some of the products mentioned were provided for an honest review, some were purchased by me.